As I prepared to come to the 2015 ASCO Annual Meeting, I have to admit that I had one trepidation—I had to present a poster. I’ll admit that, initially, I was excited that the Program Committee had accepted the work my colleagues and I did through the NRG Oncology (formerly the Gynecologic Oncology Group). It was incredibly gratifying to know there was merit in our phase I trial, built on the preclinical data from Daniela Jandial and Steve Howell at UC San Diego. However, after the initial excitement of hearing it was accepted for a poster discussion wore off, I realized it meant I had to actually present it. I entertained thoughts of putting up the poster as required and then going off to do the myriad other things I had to do instead. But then, I realized what a wasted opportunity that would be. Presenting a poster not only provides the opportunity to discuss your work, it is an opportunity to see what questions others might have, which, in turn, can give you a sense of what ultimately needs to go into a paper and the Discussion section. Indeed, looking back on my prior experiences, these Poster Sessions helped me anticipate and ultimately address critical issues pre-emptively, making the peer review process of publication a little bit easier. More than that, though, I believe now there is an obligation to be present with your poster and it is the opportunity to network. For me, it is mostly about catching up with colleagues also at the Annual Meeting, because ASCO is often the only time I see those from my days in New York and Providence. It is also about talking to young faculty—residents, fellows, and new attendings. It is the opportunity to interact with those newly committing to careers in medical oncology and offer advice or friendly words of encouragement. These are also important aspects of presentation for me and, as I looked back, it was easy for me to recall how approachable everyone was back when I was a new attending. I remember meeting Sandy Swain and Edith Perez at their posters and Jon Ledermann as he presented his work. I remember how collegial they all were—as if I was already a peer. Experiences like this can be formative and encourage a new generation to become involved in clinical research. Oncology is a community, after all—of deeply committed individuals working to cure these diseases and, short of that, to sustain the lives of those impacted by them. And so, I will proudly stand by my poster and welcome those who wish to chat, just like those who mentored me taught me to do. 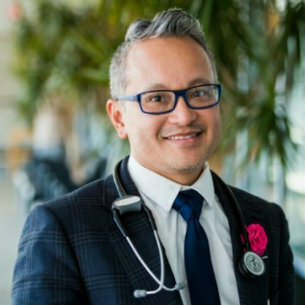 Dr. Dizon will be standing by his poster (#73 in the Oncology Professionals Hall) during the Gynecologic Cancer Poster Session on Saturday, May 30, between 1:15 PM-4:45 PM, and will be at the Poster Discussion Session immediately afterwards. View the poster and abstract online through ASCO’s Meeting Library.